Cubs president of baseball operations Theo Epstein said today that he will no longer publicly address the team's plans regarding top starter Jeff Samardzija during the season, reports Mark Gonzales of the Chicago Tribune. Speculation has spun all offseason between the possibilities of a new deal or a trade of the 29-year-old hurler, who is under team control for two more years. "We talked about it early in spring training," Epstein said before today's game. "We indulged the questions. Right now we're just focused on the games and just going out and winning." Going on to discuss the team's general approach, Epstein indicated that the club would be cognizant of its place on the win curve in considering its options. "All contracts collectively form a market and you have to be aware of the market and operate in the market when you're in free agency, and it affects everything you do, to a certain extent. But we have to make smart decisions for our situation, for the situation we're in now and the situation we're going to be in in a few years." One key point that emerged out of the two sides' discussions to date was that there is an apparent gap between the team's current valuation of Samardzija and his belief in where his market value will lie after the season. Though he has shown impressive strikeout ability, Samardzija failed to convert that into consistent results last year, finishing with a 4.34 ERA in 213 2/3 innings. He is off to a good start in 2014, as he tossed 7 innings of shutout ball, allowing just five hits and striking out three while walking two batters. An earlier version of this post passed on an incorrect interpretation of Epstein's comments, which had indicated that the Cubs would not discuss a contract extension during the regular season. Gonzales has clarified his report, indicating that Epstein's comments were meant to address his intentions regarding future public comment on the club's plans regarding Samardzija. Outfielder Brennan Boesch will stay with the Angels organization after not making the club's Opening Day roster, reports Chris Cotillo of MLBDailyDish.com (via Twitter). Boesch had a "soft out" date in his contract that came due yesterday. After a nice run in the spring, the 28-year-old will apparently wait for a major league opportunity while working in Triple-A for the Halos. In four years at the MLB level, Boesch has a cumulative .260/.315/.418 triple-slash. As reported earlier today, Henry Rodriguez of the Marlins will likewise stay with that organization rather than looking for a new opportunity on the open market. The Braves have inked southpaw Luis Perez, who was recently cut loose by the Blue Jays, reports Cotillo (Twitter links). The 29-year-old had some success at the big league level with the Jays in 2012, putting up a 3.43 ERA in 42 innings. Perez missed much of 2013 due to Tommy John surgery and recently underwent another procedure to remove scar tissue, but will go to Atlanta with hopes of finishing his rehab and returning to the MLB mix. As David O'Brien of the Atlanta Journal Constitution reports, the team is hopeful that he can be a significant contributor later in the season. Outfielder Brandon Boggs has been released by the Braves, according to the International League transactions page. The 31-year-old has seen 382 plate appearances in parts of four big league seasons, posting a cumulative .209/.315/.380 line. Last year, at Triple-A, he slashed .236/.331/.353 in 476 trips to the dish. Former major league righty Mike MacDougal has signed on with the Atlantic League's Camden Riversharks, Cotillo tweets. The 37-year-old last saw MLB time in 2012, and was a regular as recently as 2011, when he threw 57 innings of 2.05 ERA ball with the Dodgers. MacDougal worked to a 5.40 ERA in 45 Triple-A frames last year. The MLBTR DFA Tracker is, perhaps, as full as it has ever been, with eighteen players in DFA limbo. Among those whose resolution dates are fast approaching are Carlos Peguero (Royals), Raul Valdes (Astros), and a trio of Mariners (Bobby LaFromboise, Xavier Avery, and Carlos Triunfel). MARCH 31: Though a deal has not been completed, it is still possible that one could be reached during the season, reports Ken Rosenthal of FOX Sports (via Twitter). MARCH 21: The Indians have reportedly approached All-Star second baseman Jason Kipnis about an extension, and the two sides have both agreed to set an Opening Day deadline on the negotiations, reports Jon Heyman of CBS Sports. Should Kipnis and his agents at the Beverly Hills Sports Council not be able to find a common ground with the team in the next 10 days, talks won't resume until next offseason. This same situation played out last Spring Training, and obviously, no deal was agreed to prior to the 2013 season. An extension for Kipnis will likely be far more expensive next offseason than right now, however, as Kipnis will be eligible for arbitration next winter. A second All-Star nod and more MVP votes would serve him well in that process, as would the benefit of another strong season that further extends his growing track record of excellence. While the Indians were able to successfully negotiate one extension this offseason — a four-year, $25MM contract for Michael Brantley — they've reportedly ended talks with top starter Justin Masterson due to an unwillingness to meet his desire for a $17MM average annual value. The Kipnis discussions could be easier to negotiate, as unlike Masterson's case, the two sides aren't solely discussing free agent years. Therefore, Kipnis' AAV would reflect his arbitration years as well as free agent seasons, perhaps making the near-term commitment more palatable for Cleveland. Kipnis batted .284/.366/.452 with 17 homers and 30 stolen bases in 2013, delivering somewhere between 4.5 and 5.9 wins above replacement, depending on your preferred version of the metric. The Mets have signed Bobby Abreu to a minor league deal, the club announced. It was reported earlier today that New York was considering the move. Abreu, 40, will start off in Triple-A Las Vegas, and his path to a MLB role with the Mets is less than clear. After a strong run through the Venezuelan Winter League in which he showed power that had waned in recent big league seasons, Abreu put up a .244/.404/.366 line over the spring with the Phillies. He returned to the open market, however, rather than accepting a minor league slot in the Philadelphia organization. The Indians have officially agreed to a six-year, $23MM extension with catcher Yan Gomes that includes two option years, as first reported by FOX Sports' Ken Rosenthal (Twitter link). The agreement will cover two pre-arbitration seasons, as well as three arbitration years and a year of free agency (with two more free agent seasons under team control through the options). Gomes is represented by Players Edge Sports Management. The two club options are valued at $9MM (2020) and $11MM (2021), reports MLB.com's Jordan Bastian (via Twitter). Gomes will receive a $500K signing bonus, according to Jon Heyman of CBSSports.com (Twitter links), and will earn the following annual salaries: $550K (2014), $1MM (2015), $2.5MM (2016), $4.5MM (2017), $5.95MM (2018), and $7MM (2019). The options can each increase by $3MM apiece based on escalator provisions, and come with a $1MM buyout. Gomes enjoyed a nice season in 2013, slashing .294/.345/.481 in part-time play. However, he'll serve as the club's primary catcher in 2014 now that Carlos Santana has been converted to a third baseman. The 26-year-old did significant damage against left-handed pitchers last season, punishing them to a .327/ .376/.558 line, but his .336 wOBA against righties suggests he's more than just a nice platoon backstop. Advanced defensive metrics have also liked his work behind the plate. If Gomes can replicate his 2013 numbers as the club's No. 1 catcher in 2014, the deal has the potential to bring major surplus value to the Indians. In just 88 games in 2013, Gomes generated more than 4 wins above replacement, according to Baseball Reference. And while not as club-friendly as the five-year, $7MM deal with three club options that catcher Salvador Perez agreed to with the Royals in 2012, Gomes' average annual salary of $3.83MM means there's limited risk here for the Indians. The Brazilian catcher joins an increasingly crowded list of players who have been extended this offseason with between one and two years of service time. However, that list contains an outfielder, three starting pitchers and a shortstop. Instead, the most comparable deal on the books for Gomes' extension is that of his teammate, Santana. The Indians' new third baseman inked a five-year, $21MM pact early in the 2012 season. While Santana has the edge in yearly salary, Gomes' extra guaranteed year makes his deal the largest ever given to a pre-arb catcher. 5:28pm: Blanco has not officially retired, reports Jack Magruder of FOXSportsArizona.com (via Twitter). 5:17pm: Veteran catcher Henry Blanco has officially retired and accepted an unspecified position with the Diamondbacks' Major League coaching staff, the D'Backs announced via press release. A veteran of parts of 16 Major League seasons, Blanco split the 2013 season between the Diamondbacks and Mariners, batting .142/.228/.246. Though his overall numbers weren't much to look at, Blanco clubbed a grand slam in his first game with the Mariners and chipped in another slam later in the season with Seattle. He had signed a minor league deal to return to the D'Backs this winter but did not win the backup catcher's role in Spring Training. Blanco's lengthy professional career began in the 1980s, when the Dodgers inked him as an amateur free agent out of Venezuela. He would make his big league debut with Los Angeles nine years later in 1997 and go on to also don the uniforms of the Rockies, Brewers, Braves, Twins, Cubs, Padres, Mets, D'Backs and Mariners. Blanco finishes his career with a .223/.288/.361 batting line to go along with 72 homers in 3097 big league plate appearances. Always known for his defense behind the plate, Blanco gunned down a highly impressive 43 percent of attempted baserunners in more than 7000 career innings behind the plate. Blanco earned just shy of $17MM in his playing career, per Baseball-Reference.com, and should have a wealth of knowledge to instill upon younger players as he begins his coaching career in Arizona. MLBTR wishes Blanco the best of luck in his coaching career. The Tigers have signed star slugger Miguel Cabrera to a major long-term contract extension, the team announced. On top of the two years and $44MM he is already owed under a prior extension, Cabrera will be under contract for an additional eight years and $248MM, with two more years possible via successive vesting/club options. All said, the Tigers will field the two-time American League MVP through at least the 2023 season, his age-40 campaign. With those numbers, the deal would set several high-water marks. Most notably, an average annual value of $31MM would top the newly-minted record of $30.7MM set in the Clayton Kershaw extension. The figure of $248MM in new money would represent the the third-largest single contract in MLB history (and the biggest contract given to anyone other than Alex Rodriguez). With ten years and $292MM in overall future commitments to Cabrera, the Tigers stand to owe him more than any team has ever owed a single player at any point in time, besting the ten-year, $275MM Rodriguez contract in that respect. And that is all before factoring in the deal's two vesting options, which could add two additional seasons at $30MM apiece. Each of those options vest only if Cabrera finishes amongst the top ten of the MVP vote in the year prior. The deal is slightly backloaded, as Cabrera will earn $28MM in 2016 and 2017, $30MM a year over 2018-21, and $32MM for both of 2022 and 2023. Cabrera can also rack up significant additional earnings through a host of performance and awards bonuses, including $2MM for each MVP award. The Relativity Baseball client, who turns 31 in April, has been the game's most consistent force at the plate for at least the past four seasons. Over those campaigns, Cabrera has logged successive OPS+ figures of 178, 179, 164, and 187. Of course, in the "down" year of 2012, he also managed to secure a Triple Crown. 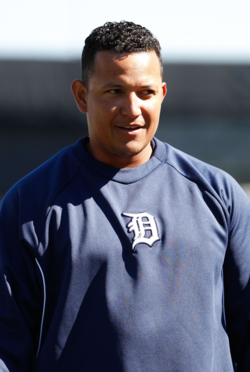 Cabrera's current deal — an eight-year, $152.3MM extension — has paid off handsomely for Detroit. The Venezuelan slugger has racked up a cumulative .327/.407/.588 triple-slash and 227 home runs over that deal. He leads the bigs in homers and slugging percentage over that time, is a close second in average to Joe Mauer, and lands fourth in OBP. And, yes, he is comfortably ahead of all other players with 737 RBI in the same term. Cabrera is set to shift back to first base after spending the last two seasons at the hot corner. Though advanced defensive metrics have not loved his glove on either side of the diamond, they generally prefer his work at first. Unsurprisingly, the 6'4", 240-pound Cabrera has not been valued as a plus on the basepaths, though neither has he been a serious negative in that area of the game. While there has been some controversy over Cabrera's successive AL MVP awards, given that his contributions come almost exclusively at the plate, there is no doubting his offensive prowess and status as one of the game's few truly elite players. Indeed, he has accumulated a healthy 36.4 rWAR and 35.1 fWAR over his time in Detroit. The question remains, however, whether he can continue that remarkable pace well into his thirties. Though Cabrera has certainly shown no signs of slowing in the immediate term, he is already under contract for two more years. That deal takes him trough his age-32 season, so any new guaranteed years would be buying out his age-33 campaigns and beyond. Cabrera's extension is not only larger, but starts at an older age than other recent comparables. The biggest free agent deals for first basemen are the ten years and $240MM given to Albert Pujols and the nine-year, $215MM Prince Fielder contract. On the extension side, Joey Votto's ten-year deal guaranteed him $225MM in total. The Cabrera deal covers his age-33 to 40 seasons. Pujols signed on for his age-32 through 41 seasons, while Fielder's contract runs from his age-28 to age-36 years and Votto's deal (inked while he still had two years left on his original extension) goes from age 30 to 39. Viewed in this light, the staggering overall commitment is fraught with risk. Needless to say, the Pujols contract looks to be a bad one at this point. And while it is easy to say that Cabrera represents a better risk at this point, he is not on the kind of all-time-great pace as was Pujols when he inked his deal. To be fair, Pujols was coming off of a year in which he posted a personal-low 147 wRC+ and was valued at 4.4 fWAR, but before that he had posted ten straight seasons with at least a 150 wRC+ and 7 fWAR tally. Cabrera, on the other hand, is coming off of his best-ever season in terms of wRC+ (a remarkable 192 mark), but peaked at 7.6 fWAR. His early-career history features less outstanding seasons at the plate than Pujols had, and Cabrera has only topped 6 fWAR in five seasons due to his lesser contributions in other aspects of the game. Most importantly, of course, Pujols was a free agent while Cabrera is still two years away from the open market. If anything, the fact that Pujols had a season that hinted at decline before landing his deal is reason for further wariness with respect to a pre-free agent commitment to Cabrera. To be sure, the Tiger is a great player. But it is difficult to see this deal creating surplus value for Detroit, and rather easy to see how it could end up working out poorly for the club. With that in mind, why didn't the team wait at least another year before moving to lock down Cabrera? Jon Heyman of CBSSports.com first reported that the sides were close and that a deal had been reached (via Twitter). Jon Morosi reported (via Twitter) that the deal was for eight years and approximately $248MM. ESPN.com's Jerry Crasnick reported that the deal would extend the total commitment to ten years and just under $300MM (links to Twitter). Chris Cotillo of MLBDailyDish.com first suggested the $292MM total commitment figure on Twitter. Heyman reported the presence and value of the vesting options (via Twitter), and reported the final contract breakdown (Twitter links) and bonus provisions (Twitter links). Right-hander Henry Rodriguez has elected to remain with the Marlins organization rather than electing free agency after being reassigned to minor league camp at the end of Spring Training, tweets Juan C. Rodriguez of the Miami Sun-Sentinel (who reported this weekend that the flamethrowing righty was weighing his options). He had signed a minor league deal with Miami back in January. Rodriguez's blistering velocity has tantilized many organizations throughout his professional career, but he's never been able to consistently command his fastball, thus leading to a great deal of walks. Though he posted a 4.09 ERA in 22 innings last season, the 27-year-old Rodriguez struck out just 12 and walked 20. Throughout his career, he's averaged 9.1 K/9 but 6.2 BB/9 to go along with a scintillating 98 mph average on his fastball. Rodriguez will look to eventually work his way into a big league bullpen that will open the season consisting of closer Steve Cishek along with A.J. Ramos, Mike Dunn, Carlos Marmol, Dan Jennings, Brad Hand and Kevin Slowey. Brewers general manager Doug Melvin confirmed to Tom Haudricourt of the Milwaukee Journal-Sentinel that his club has tabled its extension talks with shortstop Jean Segura. Said Melvin: "Nothing was going to happen so we decided it didn't make sense to keep talking. We told Jean to just go out and play. We never close anything off but there's nothing going on now." As Haudricourt points out, Andrelton Simmons' seven-year, $58MM deal likely didn't do the Brewers any favors. Segura will $534K in 2014, representing a healthy (when compared to the salaries of many pre-arbitration players) bump over the $500K Major League minimum. Shelby Miller was the landmark pick that demonstrated how the Cardinals would evaluate, draft and develop pitching back in 2009, writes Derrick Goold of the St. Louis Post-Dispatch. Goold describes the Cards' prioritization of athleticism and velocity. Former Cardinals pitcher and current Padres scout Kevin Jarvis tells Goold: "For those of us in the game, what they have done should be analyzed, evaluated and then emulated." On the other side of the spectrum, the Kansas City Star's Andy McCullough examines the Royals' difficulty in developing starting pitchers over the years. McCullough spoke with left-hander John Lamb, whose rise and fall as one of the game's top pitching prospects has been well documented in the Kansas City media after he fell victim to Tommy John surgery. He also spoke with several Royals officials, who admitted their difficulty is a combination of bad luck and one particularly woeful decision. One Royals official said the decision to draft Christian Colon over Chris Sale is, to this day, the lone decision that causes him to lose sleep. However, consensus among the Royals' brass at the time was that Sale wouldn't last as a starter (they were far from the only ones to think so). White Sox manager Robin Ventura told reporters today, inlcuding Daryl Van Schouwen of the Chicago Sun-Times, that Matt Lindstrom will open the season as his closer. That's big news for Lindstrom, whose free agent stock next offseason could rise substantially with a successful season in the ninth inning. GM Rick Hahn said he hopes Lindstrom takes the closer's role and runs with it, but the bullpen roles are "not etched in stone" (Twitter links). For those fantasy baseball players out there, remember that you can follow @closernews on Twitter during the season to get daily tips and news updates for chasing saves in your leagues. The A's have signed right-hander Joe Blanton to a minor league deal and assigned him to Triple-A Sacramento, the team announced (on Twitter). By signing with Oakland, the CAA Sports client will return to the organization with which his Major League career began. Blanton, 33, struggled tremendously in his lone season with the Angels after signing a two-year, $15MM contract last offseason. Those difficulties, along with a 7.08 ERA in 20 1/3 Spring Training innings with the Halos, led to his release last week. The Angels will still be on the hook for his $6.5MM salary and $2MM option buyout. The former No. 24 overall pick posted a sky-high 6.04 ERA with 7.3 K/9, 2.3 BB/9 and a 44.3 percent ground-ball rate in 132 2/3 innings with the Halos last year. Despite a respectable ground-ball rate and solid K/BB ratios, Blanton was again plagued by a bloated homer-to-flyball ratio (19.1 percent). He's posted a well-above-average HR/FB mark in each of the past five seasons, leading xFIP (which normalizes HR/FB based on the league-average rate) to project ERAs that are consistently well below his actual results. Blanton will serve as rotation depth for an Athletics rotation that will be without Jarrod Parker for the entirety of the 2014 campaign. Oakland also has a lot riding on the fragile arm of Scott Kazmir and has already seen an injury to A.J. Griffin come up as well, so adding Blanton as a veteran insurance policy makes some sense as a low-risk, moderate-reward option. While he doesn't come with significant upside, Blanton has proven himself capable of being a solid innings eater in prior seasons.